A business associate once told me that the world is pretty much segregated by what it drinks. He opined that there are wine drinkers and there are beer drinkers, never bothering to account for those who might enjoy whiskey, gin or vodka, let alone teetotalers. At first it confused him when I would order beers he had never heard of and then discuss the merits of different vineyards on a restaurant’s wine list. I can only imagine his reaction if he discovered some of today’s brewers blending wine grape juice with their ales. It would be as if two parallel universes had collided. The division between beer and wine goes back through the centuries. The first record of beer being brewed is contained in 8,000-year-old Sumerian writings from what today is Iraq. The first known wine production goes back even further, around 10,000 years, to what is now Georgia in the south Caucasus. In Europe, most northern countries are “beer” focused, while southern countries lean in the direction of wine. Then there is the vodka belt and the whisky makers. Much of this has to do with growing conditions and traditions. Yes, you can get a great riesling in Germany and find locally made beers in Italy, but the truth is that most locals and tourists in these countries consumer the beverages that each land is best known for producing. Brewers and winemakers also tend to be fairly chauvinistic when it comes to the merits of the liquids they produce. Winemakers will readily admit that it takes a lot of great beer during harvest season to produce good wine, but it is highly doubtful any would consider blending their wine with beer. That creative twist has been left to craft brewers and their quest for the next interesting taste sensation. “Twenty-five years ago I got out of the wine business because I did not like to be beholden to the changes in the weather, now I’ve gone full circle,” says Ron Gansberg, brewmaster at Cascade Brewing in Portland, OR. Cascade has become known for its sour beers and barrel-aging program, which has brought Gansberg back in touch with fruit and the idea of blending juice with beer. 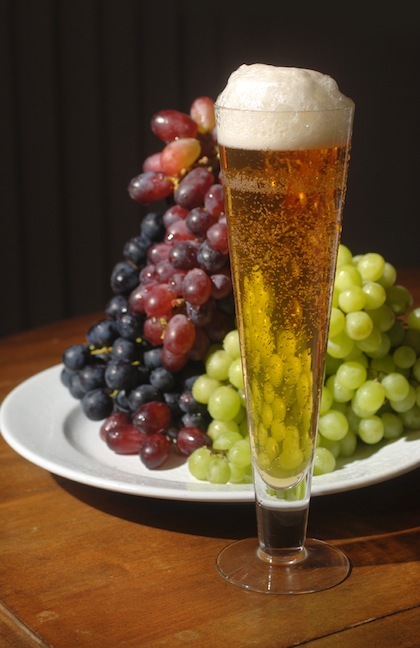 In 2008, Cascade The Vine was the first ale Gansberg produced using grapes, relying on Niagara, a labrusca grape that in addition to making wine is the source of much of the white grape juice sold in the U.S. In 2009, Cascade Sang Royal was made using cabernet sauvignon grapes that were blended with a red ale and aged for 16 to 18 months in ex-cabernet sauvignon barrels. Previous vintages of the beer had been made using cherries. “When you are working with grapes you really try to capture the essence of the fruit, while maintaining the character and balance of the beer,” Gansberg says. Still, weather conditions can throw a wrench into the works. Cascade did not produce any 2010 vintage of The Vine or Sang Royal because of poor grape quality. Gansberg laments that the 2011 growing season also got off to a rough start, but might still turn around in time. In Syracuse, NY, Empire Brewing started using Concord grape concentrate from Finger Lakes vineyards in late 2009. Brewer Tim Butler says Empire Deep Purple was originally going to be a seasonal offering using an American wheat beer base, but now has become a part of the regular rotation at the brewpub because of customer demand. At first Butler was concerned how the brewery’s ale yeast might react to the grape juice and he also wondered if extra cleaning procedures would be needed for equipment and tap lines. However, the yeast has performed well and the brewery’s regular cleaning regime has been all that has been needed. Not far from Syracuse, War Horse Brewing in Geneva, NY, has been using an American wheat ale and riesling grape juice to create War Horse Riesling Ale. In wider distribution this year from MolsonCoors will be Blue Moon Vintage Blonde Ale. The 2011 beer is part of the Brewer’s Reserve Series and is being brewed with Chardonnay grape juice. The beer already has chalked up a gold medal from the 2010 Great American Beer Festival. Belgian brewer Cantillon makes two beers that are married with wine grapes. Cantillon St. Lamvinus is a 2-year-old lambic fermented in former Bordeaux barrels with the addition of merlot grapes. The beer is produced just once a year with a limit supply of 750 ml bottles imported to the U.S. Cantillon Gueuze Vigneronne is an ale base with muscat grapes added. The aging of this ale takes place in new oak barrels for three months and it is blended with more gueuze at the time of bottling. In California, at least two San Diego-area craft brewers have used grapes as part of one-time release offerings. Stone 10.10.10 Vertical Epic Ale was a complex Belgian-style strong pale ale made for release in 2010 that had a blend of muscat, gewurztraminer and sauvignon blanc grape juice added during the second fermentation. In celebrating its 21st anniversary in 2010, Karl Strauss Brewing made a Belgian-style strong ale with the juice of old vine zinfandel grapes. The brewery aged the beer for just a month so the oak would not overpower the subtle pepper notes of the grapes. As more consumers experience the flavors of Belgian-style ales and the makers of both sour ales and wheat beers experiment with new fruit combinations, it is likely we will see more grape-flavored beers hit retail shelves. This may be especially true in regions of the country with winemaking traditions. It just might be that your next beer will have been plucked from a vine. Hi, I just came across your website because I was doing research for an article I’m writing about wine/beer hybrids for CT Food & Farm Magazine and I read your 2011 article on “Grapes and Grains” and I just wanted to give you a thumbs-up for what you do! Keep up the good work!